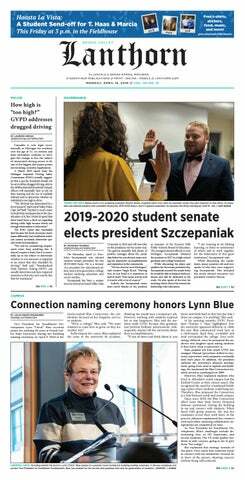 Each Thursday, Grand Valley State University's student senators convene in Allendale campus' Kirkhof Center for their general assembly meeting. For the final GA before spring break, however, senators decided to change things up. For the first time ever on Thursday, March 1, Student Senate held its weekly GA meeting in the university club room on GVSU's Pew campus. The push for the Grand Rapids meeting location came from several downtown-based senators, including Senater Olivia Kolc who helped organize the downtown assembly. The final GA before spring break was compiled with a visitor from the Grand Rapids city manager's office, some discussions on campus affairs and approval of the body's common technical framework. Research into water-related issues and threats continue to be a primary concern for Michiganders, whose identity is rooted in the Great Lakes; this is what makes Grand Valley State University’s Annis Water Resources Institute (AWRI) so essential to ongoing discussions about water. Recently, AWRI has partnered with Michigan State University’s Institute of Water Research (IWR) to collaborate on future water research projects. Grand Valley State University is host to many events and receptions each year, including weddings, as its various campuses offer exclusive settings and exquisite backdrops for significant occasions. On Saturday Jan. 19, an anonymous GVSU alum was married on the Grand Rapids Pew Campus. The large amount of construction for the event calls into question what limits the university will go to provide a special space for a campus wedding. Grand Valley State University's Director of the Hauenstein Center for Presidential Studies and author Gleaves Whitney spoke about culture and political divides in his Common Ground speech on Wednesday, Dec. 5 in the Charles W. Loosemore Auditorium on GVSU's Pew Campus. Whitney discussed the symptoms of the current disease in body politics throughout his speech. The former Ferris Coffee and Nut facility on GVSU's Pew Campus is currently being renovated to become the new Design Center as part of the College of Engineering and Computing. The ability to renovate an existing space allows the university to avoid the delays and expenses that come when constructing a new building. The center will offer more collaborative spaces and development labs for engineering students. With Michigan primaries just around the corner, several candidates are gearing up for election season. On Saturday July 28, governor candidate Abdul El-Sayed, visited Grand Rapids for a political rally to garner support for his campaign. Hundreds of residents from the area crowded Ottawa Hills High School to rally behind El-Sayed and several local government officials.